In a magical oasis on the edge of the noise and bustle of Florence’s historic center, you can find a glittering green-blue seahorse hanging on a ribbon just a foot away from a pink calla lily lapel pin. Fiery chili pepper necklaces vie with ruby red cherry earrings and spotted ladybug pins. On the upholstered “husband” bench, beaded needlepoint pillows provide support for the viewing of one after another of the jewel-toned purses and evening clutches. This is the world of the Aprosio & Co., the dream child of designer Ornella Aprosio, master artisan of the tiniest of crystal and glass beads. The art of beadwork was very popular at the beginning of the 20th century, reaching its height with the “flapper” styles of the 1920s, but with the worldwide depression of the 1930s the lighthearted designs disappeared and the artisans couldn’t sell their creations. 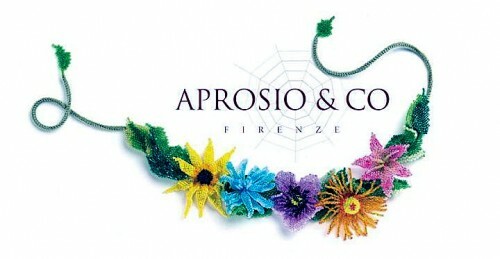 Spring comes to Aprosio & Co.
A Rome native, Ornella Aprosio began her career as a professional bead designer in 1993. Before that she was a restorer of antique clothing, including evening gowns dating back to the 1920s, thus giving her expertise in working with complex beadwork. 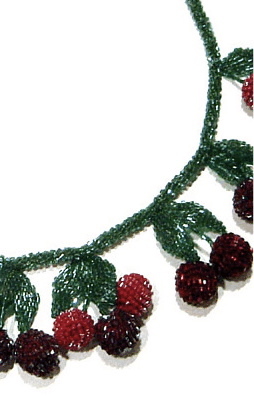 There were no teachers for beaded jewelry, so she had to experiment with each of her early pieces. 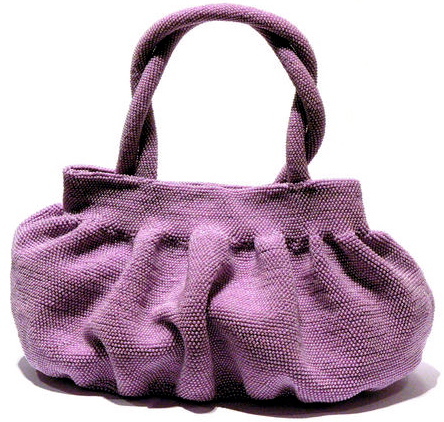 Now, besides creating her own unique pieces, Ornella employs about thirty artisans. 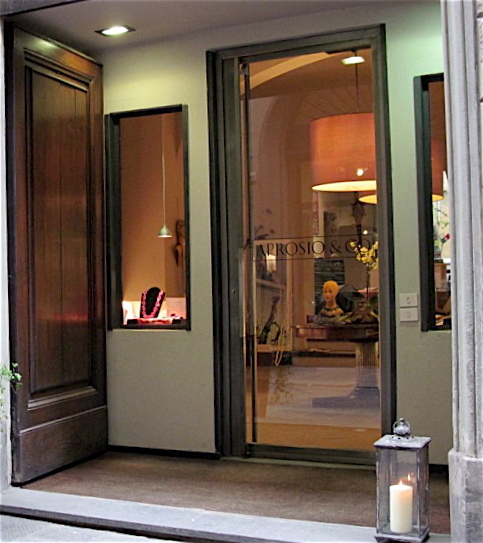 Her bi-level store with its ivy-covered courtyard is located in the Palazzo Frescobaldi on Via Santo Spirito. The shop is graced by the presence of Monsieur Maquis, Ornella’s dog, and a suitably aloof cat. 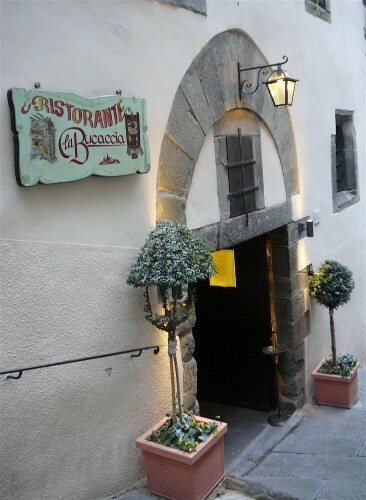 A couple of months ago she opened another location across the river on Via della Spada. Although some of the simpler pieces are affordable to all, Aprosio’s wares are not inexpensive. The prices reflect the skill and time required to produce each piece by hand, as well as the fine materials she personally chooses – Venice’s Murano micro glass beads (known as conteria) from Venice and Bohemian crystal beads from the Czech Republic. 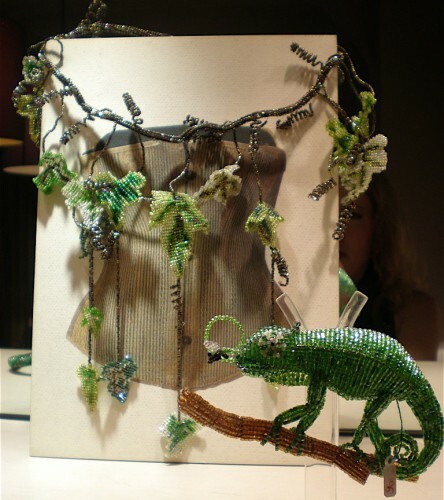 Ornella’s designs are made one by one by her specially trained artisans and therefore have variations that make each piece unique. The three dimensional quality of the more complex pieces and the depth of color and shine are created with the different methods of construction; some are crocheted, others knitted, the cushions use needlepoint, and the scarves have beads woven into fabric. The different shapes, glitter (matte glass Italian conteria, sparkling Bohemian crystal seed beads) and colors of the beads highlight the details and expertise of the designs. Ranging from classic shapes – simple soft stretchy bracelets, a classic knotted necklace and brightly colored ball ear posts – to the more extravagant complex pieces – bumble bee pins, art deco evening bags, and orchid necklaces – that can take up to weeks to create, Aprosio has something for every taste. The spider’s web, celebrated for the natural perfection of design is an Italian symbol of good luck and fortune, was integrated in Aprosio’s logo. And spiders, beetles, lizards, ladybugs, snakes and bats show that Ornella has a quirky sense of humor. The thought of an Aprosio gold and black striped bee with silver wings perched on the shoulder of a little black cocktail dress is the perfect image of the brand. 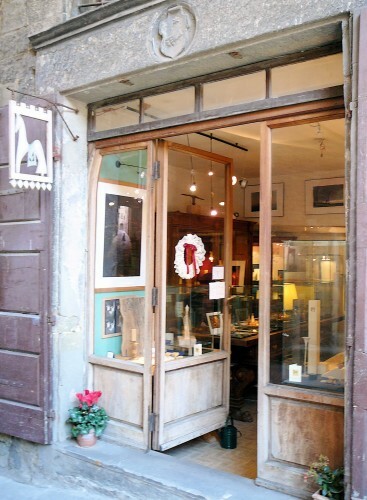 Fifteen years ago on my second visit to Italy, I went to Cortona. Why? To have tea with Frances Mayes, of course. I planned to spend the following year under the Tuscan sun – a sabbatical from my law firm life. Who else would be the best source of info? We did not sip tea under the shady arbor of grapevines, near the fragrant lavender patch, behind the golden and peach-colored walls of the restored Bramasole villa. No, we sat in the back of the Caffe Bar Signorelli in the main square of Cortona for two hours over countless cups of ever-weaker tea. I can’t remember what I learned about how to have an exceptional extended vacation in Italy, but I remember the author was charming and was a major proponent of buying a second home in Tuscany. On the same visit to Cortona, I also met Umberto Rossi. Some would call him a falegname – a craftsman of wood – although the better term would be artisan. Umberto is a master craftsman in “turned” wooden objects, using a lathe to make the thinnest possible wood bowl or objet d’art. But it was the fruit he created that caught my eye – apples of acacia or palisander wood, pears of tulipwood, and two cherries of cherry wood, joined by stems of lemonwood, no thicker than the real thing. 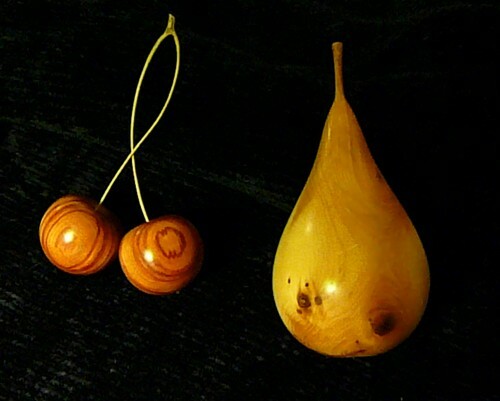 Umberto's pear of tulipwood and cherries of cherry wood. I met Umberto in his small shop on the same square where I had tea with Frances. After a long discourse on how each item was made and the decisions that go into choosing the wood, the preparation, the tools and the amount of skill and labor that go into each item, I bought three pieces. Umberto said he couldn’t understand why someone would buy a piece of his work and not ask about the type of wood or how it was made. That wasn’t a problem with me. I wanted to know about all of it. I had never seen such intricate craftsmanship with such an eye to detail outside of a museum. He invited me to visit his workshop just down the hill on Via Guelfa. My memory of this place is that it was crowded, dark, cold, and full of sawdust and pieces of wood, as well as all of the equipment needed for his work – but it was a long time ago, I may have the details wrong. It was there, looking at rough chunks of chestnut and olive wood, small logs of mahogany and rosewood, and even a cube of ebony, that the philosophy attributed to Michelangelo came to mind – Umberto seemed to look at a piece of wood and envision the form contained inside and it was his mission to bring it to life. 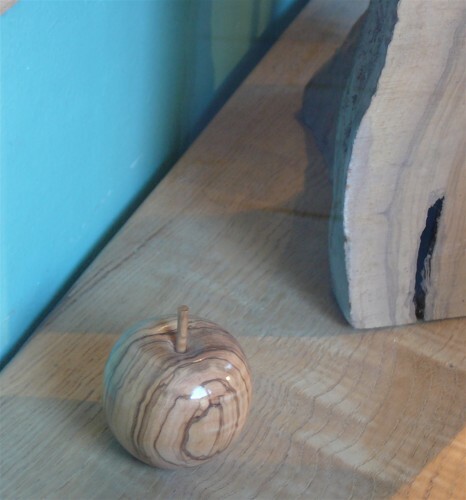 An apple made of palisander wood. Then, Umberto invited me home to meet his wife, Dee, who, like Frances Mayes, was from the American South. Maybe it was that southern hospitality, but Dee kindly interrupted her dinner preparations to make coffee for the tourist her husband brought home with no warning. I never did learn how Dee Morton, an artist from Georgia ended up in a cozy apartment in a soon-to-become-famous, but now a definitely obscure, rocky hill town on the edge of Tuscany, with woodworker Umberto Rossi. Besides cooking dinner and making coffee, she was wrangling two kids, the youngest just one year old – it didn’t leave a lot of time for personal histories. 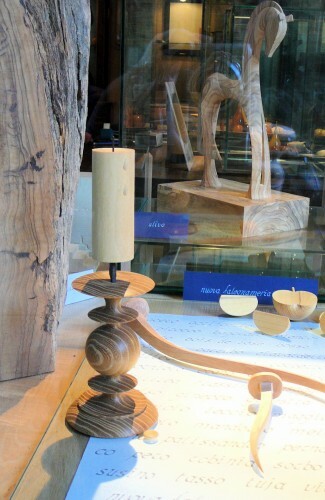 Turned and carved wooden objects in the window. Last week, I went back to Cortona. Frances Mayes has since moved to North Carolina. 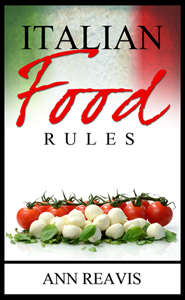 Umberto’s shop was closed tight by ancient faded green wooden doors – no way to peer in, no big sign to say it was still his shop – but there was a small card taped to the door that gave a phone number and directions to the workshop. “Open on request.” As I debated the issue, a woman arrived wearing a warm coat and jaunty beret. It was Dee Morton. 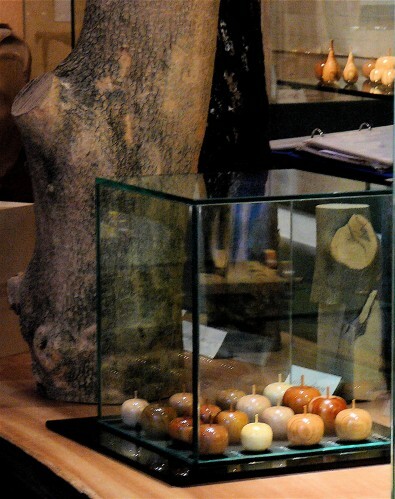 Apples in a variety of woods in the showroom. The shop is now a showroom – same size, but with elegant glass cases. Umberto’s exquisite work remains the focus, but now also there are Dee’s drawings and paintings on the walls and the artwork of their talented now-teenaged children on display.